The governor of the Bank of Canada, Mark Carney, apologized Monday for the recent controversy over the new $100 bill. Attempts to design the note so that the image of the person shown did not resemble any actual person resulted in "an image that appears to represent only one ethnic group," something that was not the bank's intention, Carney said in a news release. The Bank purged the image of an Asian-looking woman from its new banknotes after focus groups raised questions about her ethnicity. 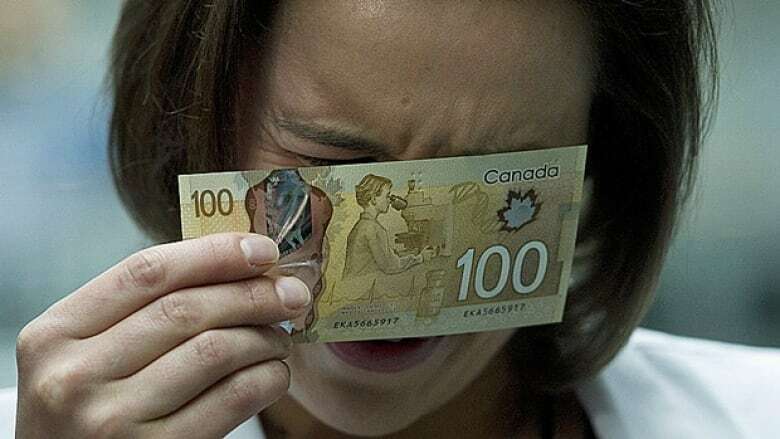 The original image intended for the reverse of the plastic polymer banknotes, which began circulating last November, showed an Asian-looking woman scientist looking into a microscope. P.O.V. Should the bank have changed the $100 based on the criticism? Take our survey. "Some have concerns that the researcher appears to be Asian," says a 2009 report commissioned by the bank from The Strategic Counsel, obtained by The Canadian Press under the Access to Information Act. Carney said the focus groups were used in the early stages of the design process "to test what types of images best evoke the themes" for each of the denominations. One of these was a "Photoshopped" image based on an original photograph of a South Asian woman, he explained. "As is always the case, in the subsequent design of the actual $100 note, the designers created an original set of images from the ground up. On the actual bank note the researcher was drawn so as to not to resemble an actual person. Therefore, the final image did not look the same as the Photoshopped image shown to the focus groups," Carney said. "All of this occurred in the early design stages before the final design was presented to, and approved by, myself and the Senior Deputy Governor. In the development of our $100 bank note, efforts by the bank note designers to avoid depicting a specific individual resulted in an image that appears to represent only one ethnic group." "That was not the Bank's intention," Carney said, "and I apologize to those who were offended — the Bank's handling of this issue did not meet the standards Canadians justifiably expect of us." He said the bank will be reviewing its design process in light of these events. "This is a win-win," Victor Wong, executive director of the Chinese Canadian National Council, said after the apology was issued. On Friday, the CCNC had demanded the bank acknowledge its error in "caving to the racist feedback" and purging the image. The CCNC said Monday it appreciated the apology and has offered to give input into the bank's review process. Queen’s University marketing professor Ken Wong said Carney really didn't have a choice about apologizing, given the public outcry, but described the controversy as "political correctness run amok." The image should never have been changed in the first place, Wong told CBC News, saying that as one of Asian heritage, he found the entire discussion silly. "He’s apologizing for something (not depicting enough ethnic groups) that really wasn’t the source of the original complaint (of alleged ethnic stereotyping)," said Wong, "because if you take it out to its logical extension, it says there would never be anybody on a piece of currency unless we’re prepared to have a whole whack of people representing the diversity of the Canadian population."